India’s success in services export has been remarkable, but it has also been largely led by a single sector – information technology (IT) and IT-enabled Services (ITeS). For the country to achieve long-term growth and fulfil its development aspirations, we must look towards expanding our service exports base, observes Dr Anupam Khanna. In this article, he argues that there is tremendous potential for India to grow its modern services exports, particularly through IT-led productivity improvements and leveraging the IT/ITeS industry’s well-established global reputation. The Indian IT and ITeS industry is the envy of many nations. Its iconic status dates to the last decade. Its exports performance has remained buoyant despite the global financial crisis and its lingering aftermath. Labelled as the world’s back office, India has emerged as the outsourcing destination today for a wide favoured portfolio of computer and data processing services. It accounted for 42 percent of the imports of such services from United States, the world’s largest market, in 2012. 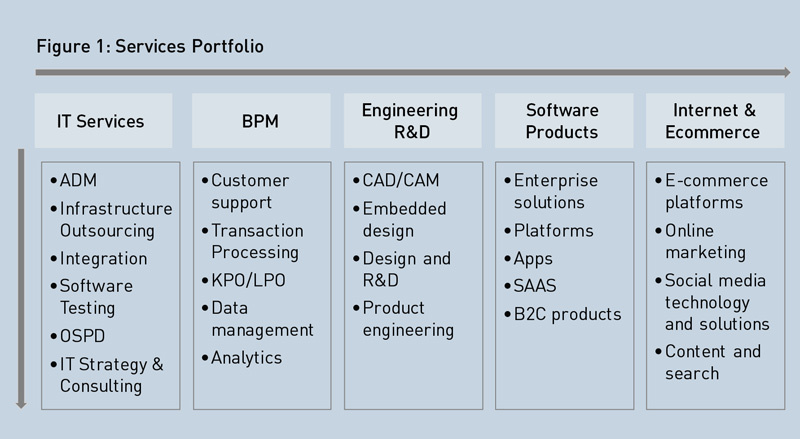 The Indian industry is uniquely capable of providing end-to-end services in IT, business process management (BPM), software products as well as engineering research and development (ERD), including design and testing, and is rapidly acquiring similar capabilities in Internet and e-commerce (see Figure 1). Despite a variety of internal and external challenges, India’s dominance as a global player has continued to increase; according to NASSCOM estimates, India’s share in global market has increased by three percentage points in 2013 to 55 percent. Moreover, specialised business consulting and advisory firms such as AT Kearney, Everest and Tholons are unanimous in ranking India (and the main IT industry agglomerations) as the “undisputed leader, unrivalled in both scale and skills” among offshoring locations. 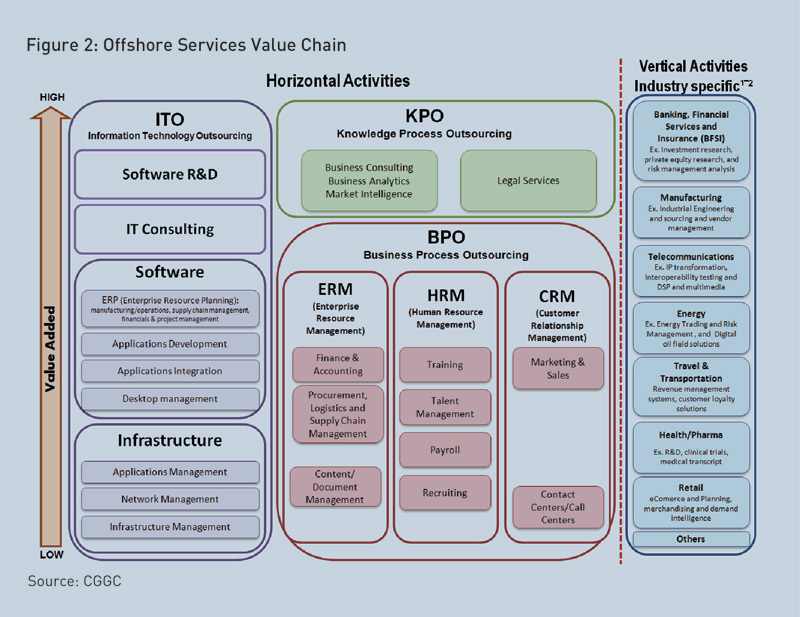 Although, competition is emerging in each segment from different countries, India is uniquely positioned as the only country that has an established presence across the entire global in the offshore services value chain (see Figure 2). The impact of the IT industry to India’s economic and social development is also profound. The aggregate turnover (excluding hardware) in the fiscal year ending March 2014 was US$105 billion, of which an overwhelming US$86 billion were foreign currency earnings critical to defraying India’s swelling current account deficit (CAD). Contributing around four percent in estimated value-added to the gross domestic product (GDP), the sector was the primary engine fuelling employment opportunities for the burgeoning young labour force in the urban areas. Direct employment in the sector crossed three million, of which the vast majority were youth in their 20s and a third were women. Moreover, the employment generator IT companies are estimated to be concentrated in six metropolitan centres, where the physical transformation of the urban landscape is also palpably driven by the gleaming industry. The prospect of securing relatively good quality jobs, in turn, has stimulated the demand for secondary education, hearteningly so among girls. Concurrently, the private sector has, also, been induced to invest in tertiary education. 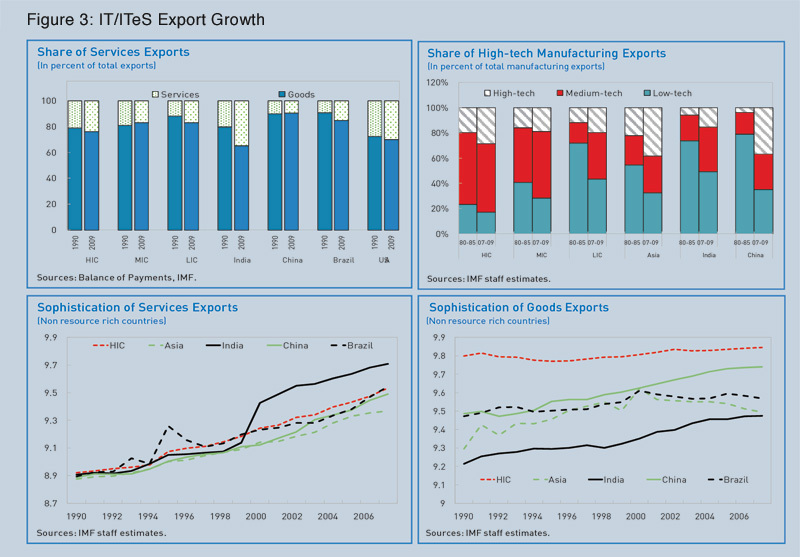 The IT/ ITeS industry has been termed the vanguard of India’s services export revolution, which, in turn, is cited as a model worth emulating for other developing countries, especially in order to avoid the “middle-income trap.” India’s success in exporting services was indeed exceptional, especially over the past decade. India’s share of the global services trade grew more than six-fold in the post-liberalisation period, from 0.5 percent in 1990 to 3.3 percent in 2010, doubling in the first decade and then tripling in the second. Services now account for more than a third of the total of Indian exports. Indeed, based on the data from the World Development Report, India recorded the fastest growth (averaging 26.5 percent per annum) in services exports during 2001-2010. The big expansion was related to “modern services” comprising software, financial, communication and business services that now make up three-quarters of India’s total services exports against traded “traditional services”,which include travel, transportation and insurance. (A third category, “social services,” are generally not traded, though this is also changing). Delving deeper into the data, in net balance terms, the real story turns out to be an IT/ ITeS driven tale as the share of software increased from 34 percent to 52 percent of aggregate service exports. Meanwhile, other service sectors including communications and financial services, which grew rapidly during 1981-2000, recently witnessed trade deficits. Besides, contributing directly to the balance of payments, exports drive economic development through the learning they foster and accumulation of technological capabilities. A substantial body of economic research indicates that it is not just how much a country exports (or produces) that matters for sustained economic growth, but also what those goods and services are and the markets they serve. While much of this research pertains to manufactured goods; however, recent analyses have focussed on export sophistication in services as a leading indicator of long-term growth in developing countries. As noted by the International Monetary Fund (IMF) in its 2012 country report, India stands out, but once again a quick scanning reveals that its trajectory closely tracks the path of IT/ ITeS export growth (see Figure 3). Yet another argument, in favour of a growth strategy led by service exports for countries such as India, zeroes in on the resilience of the services trade to global economic conditions particularly during the financial crisis. Drawing upon recent events, where merchandise trade crashed while services weathered the storm relatively well, some research suggests that demand for services is less cyclical while supply is less dependent on external finance, thereby diminishing the effects that typically amplify the impact of the crisis. A more granular analysis disaggregating sectors provides more accurate insights, revealing sharp differences even between subsectors (e.g. banking and insurance, freight transport and tourism). More specifically, in the case of India, service exports proved to be surprisingly resilient during the recent global economic crisis despite the heavy concentration of markets in North America (60+ percent) and Western Europe. The roots of the demonstrated resilience, spanning both the demand and supply sides, lie squarely within the specifics of the durable IT/ITeS business models. To recapitulate the basic point being made above, the Indian services export revolution thus far has had a very narrow base that is essentially the IT/ ITeS sector. Going forward, this needs to change for a number of different reasons. First, to take advantage of booming opportunities in global trade where services commerce is undergoing transformative change with the advent of “servicification” and of value chains driven primarily by advances in information and communication technology (including broadband Internet, cloud computing and associated mobility applications). Second, in very mundane terms, the export imperative is severe for the Indian economy in light of continuously expanding requirements for energy and capital goods; even if manufactured exports regain buoyancy, their import intensity implies that service exports will need to grow rapidly to balance the nation’s current account. The aggregate turnover (excluding hardware) in the fiscal year ending March 2014 was US$105 billion, of which an overwhelming US$86 billion were foreign currency earnings critical to defraying India’s swelling current account deficit (CAD). Contributing around four percent in estimated value-added to the gross domestic product (GDP), the sector was the primary engine fuelling employment opportunities for the burgeoning young labour force in urban areas. Third, simple arithmetic reveals the imperative to expand the base in order to make tangible progress in terms of India’s developmental aspirations and potential. For example, the demographic dividend that is expected to propel India’s sustained growth over the next decade or two will only be realised if there are enough opportunities for productive employment and suitable avenues for the country’s youth to acquire the requisite skills. This is not just for expanding competitive service exports but for assuring the rapid growth of vocational or skills-based education and thus increasing productivity of the Indian economy as a whole, of which the service sector accounts for two-thirds of the output. Indeed, recent economic studies both in India as well as in other countries (e.g. Indonesia, Chile and various transition economies) document the critical role of services liberalisation and competitiveness in improving the performance of manufacturing industries. The steadily widening range of business lines, greater sophistication of service offerings and increased complexity of activities in various segments of the Indian IT/ITeS industry are testament to the effectiveness of erecting both technology ladders and constructing bridges into adjacent sectors to improve their productivity. Until now, the industry has stuck close to its knitting, with relatively minor forays into other sectors, but it is on the cusp of change. This change is partly driven by the emergence of new verticals (such as healthcare) in traditional markets and promising business opportunities for the IT industry in India such as e-commerce and education. Another factor is the need for domain and contextual knowledge. Technology from the IT/ITeS sector (BPO, Software and ERD) in India can provide a robust platform for increasing the competitiveness of Indian services and product offerings around the world. There is also a tremendous opportunity to leverage the Indian IT industry’s magnificent international brand value for the promotion of exports in many modern service sectors where reputation plays a decisive role in securing business. 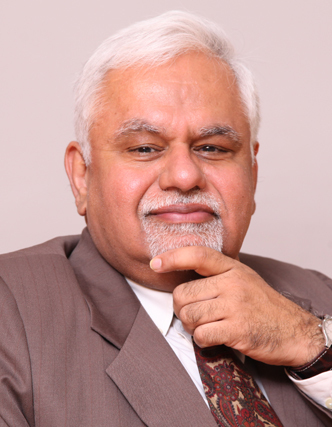 Two factors, that continue to play a critical role in the evolution of the Indian IT/ITeS industry, are the abundant availability of talent (buttressed considerably by the industry’s acquired competence in retraining workforce) and the attraction of foreign direct investment (FDI), including captive subsidiaries termed global in-house centres (GICs), where India continues to be a highly favoured location. Such investments have proven to be valuable in providing access both to technology as well as markets. There appears to be some scope for diversifying strategies to upgrade participation in various value chains so as to capture greater value and gain more control over intellectual property (IP), notably patents. Fuller (2014), for example, describes the different strategies pursued by the Chinese and the Indian industry in integrated circuit chip design, whereby the former has forged close linkages with domestic chip producers while the latter is oriented towards supplying pure services to overseas firms. The IT/ITeS sector has also spawned an extraordinary burst of entrepreneurial activity seeking to emulate Silicon Valley success stories. Combined with the technological capabilities alluded to above, innovation has received a tremendous fillip and is beginning to capture the imagination of established business leaders and government policy makers alike. Most gratifying is the remarkable number of efforts being undertaken to promote inclusive development by addressing the needs of people with limited ability to pay, especially in relation to health, education, transport and communications. Interestingly, this has reportedly also spurred multinational firms to locate their product development centres for low-income markets in India. This would help India diversify its export destinations, particularly in other emerging markets (notably Asia-Pacific, Africa, Latin America and the Middle East) and low-income economies that are likely to grow most strongly over the next 5-10 years. Relative to these countries, the comparative advantage of the Indian industry may be rooted less in unit labour costs and more in its familiarity with low-income consumers, related to organisational competencies, scaling up and being the first move. To summarise, the time is now right for the Indian IT/ITeS industry (and government policy makers as well) to eschew enclave mindsets and focus not just on direct exports but on the growth of indirect exports as well. To be fair, this idea is not totally new – witness, for example, the growth of the ITeS industry, but it does represent a shift in emphasis towards embedded and embodied services and final users. An important corollary would be a greater domestic orientation of the IT/ITeS industry to assist the digital transformation of the Indian economy and society; in other words, to go for transformation-led exports not just export-led growth. India’s success in exporting services has indeed been exceptional, especially over the past decade. India’s share of the global services trade grew more than six-fold in the post-liberalisation period, from 0.5 percent in 1990 to 3.3 percent in 2010, doubling in the first decade and then tripling in the second. Services now account for more than a third of total Indian exports. The discussion above points to promising prospects for India’s service exports, especially those leveraging the capabilities and reputation of the IT/ITeS industry. Although the recovery of global economic from the financial crisis is still fragile, the demand for IT services appears to be on the upswing, including in Europe where fiscal consolidation and demographics are forcing IT-enabled efficiency improvements. Developing countries are also seeking to deepen their capital assets, which in the present world means greater investment in Information and Communications Technology (ICT). These trends should not give rise to complacency, nor should the pursuit of longer-term structural shifts cause us to ease up on the national effort to improve our balance of payments if the country is to continue improving the living standards of its people. In the case of India, service exports proved to be surprisingly resilient during the recent global economic crisis despite the heavy concentration of markets in North America and Western Europe. The roots of the demonstrated resilience, spanning both the demand and supply sides, lie squarely within the specifics of the durable IT/ ITeS business models. While many of the barriers to expanding India’s service exports are the same as those afflicting merchandise trade (or indeed domestic economic activity), such as the difficulties in the business environment, policy lacunae, infrastructural constraints, educational quality and skills availability; there are some differences as well, which are rooted in the existing economic structures and business models. For example, many modern services are not capital-intensive but skill-intensive, and cash flows are different as are business contracts, thus, promotional instruments, e.g. credit facilities and financial incentives need to be substantially different. Freight and shipping costs are negligible for services but language skills and cultural affinity are very important. Domestic regulations will, such as certification requirements for professional service providers not only in medicine and health care but also in accounting, law, architectural and engineering services, play a critical role. Indeed, India itself maintains a fairly restrictive regime. Other constraints to expansion pertain to data security (including privacy) and IP regimes, and, of course, cross-border mobility of staff due to visa restrictions in many countries. Addressing these issues effectively, and their many novel and complex dimensions, requires a concerted partnership between the industry and government with considerable support from academia and knowledge institutions to articulate an actionable strategy and implement it expeditously. The intent appears to be present among various stakeholders but effective engagement is still awaiting traction. Arnold, Jens Matthias, Beata Javorcik, Molly Lipscomb & Aaditya Mattoo (2012), Services Reform and Manufacturing Performance: Evidence from India, Policy Research Working Paper 5948, World Bank. ATKearney (2014), A Wealth of Choices: From Anywhere on Earth to No Location at All, The 2014 A.T. Kearney Global Services Location Index. Borchert, I. & A. Mattoo (2010), The Crisis-Resilience of Services Trade, Policy Research Working Paper 4917, The World Bank. Chanda, R. (2008), India and Services Outsourcing in Asia, The Singapore Economic Review, 53(3). Drake-Brockman, J. & S. Stephenson (2012), implications for 21st Century trade & Development of the Emergence of Services Value Chains, International Centre for Trade and Sustainable Development. Barry Eichengreen and Poonam Gupta (2012), Export of Services: Indian Experience in Perspective, Working paper 2012-102, National Institute of Public Finance & Policy, Delhi. Everest Group Research (2014) for NASSCOM, Thought leadership Research: Cost Competitiveness of Global In-House Centers (GICs), Study Report. Fuller, D.B. (2014), Chip design in China and India: Multinationals, Industry Structure and Development Outcomes in the Integrated Circuit Industry, Technological Forecasting & Social Change, 81(1). Ghose, A. K. (2014), India’s Services-Led Growth, Working Paper 01/2014, Institute for Human Development, New Delhi. Gereffy, G., M. Castillo & K. Fernandez-Stark (2009), The Offshore Services Industry: A New Opportunity for Latin America, The Inter-American Development Bank. Ilavarasan, P.V. (2014), Executing Arms or Equal Partners? R&D Centres of Information and Communication Technology Multinationals in India, Economic and Political Weekly XLIX (34). Khuong,V.M. (2014), Information and Communication Technology and Singapore’s Economic Growth, Lee Kuan Yew School of Public Policy, National University of Singapore. Kite, Grace (2013), India’s Software and IT Services Sector – A Teacher to Treasure, Economic & Political Weekly, XLVIII (30). Kommerskollegium (2012), Everybody is in Services – The Impact of Servicification in Manufacturing on Trade and Trade Policy, National Board of Trade, Sweden. Lewis-Faupel, S., Y. Neggers, B.A. Olken & R. Pande (2014), Can Electronic Procurement Improve Infrastructure Provision, Evidence from Public Works in India and Indonesia, NBER Working Paper 20344. Loungani, P. & S. Mishra (2014), Not Your Father’s Service Sector, Finance & Development, June 2014. Mishra, S., S. Lundstrom, & Rahul Anand (2011), Service Export Sophistication and Economic Growth, Policy Research Working Paper 5606, The World Bank. NASSCOM (2014), GICs in India: Onward & Beyond – Delivering Excellence. NASSCOM (2014), The IT-BPM Sector in India – Strategic Review 2014. Sahoo, P., R.K. Dash & P.P. Mishra (2014), Determinants of India’s Services Exports, Working Paper 333, Institute of Economic Growth Delhi. U.S, International Trade Commission (2014), Recent Trends in U.S. Services Trade – 2014 Annual Report, Pub. No. 4463, USITC. Zysman, J., S. Feldman, K.E. Kushida, J. Murray, & N.C. Nielsen (2013), Services with Everything: The ICT Enabled Digital Transformation of Services in Breznitz, D. & J. Zysman (eds), The Third Globalization, Oxford University Press. Chief Economist and Director-General of Policy Outreach, National Association of Software and Service Companies.